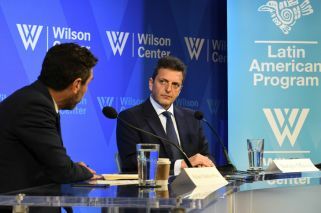 Opposition leader in full campaign mode as he details vision of Argentina's future at an event hosted by the Argentina Project and Woodrow Wilson Center in Washington DC. Sergio Massa has said that Argentina's next leader will have to renegotiate its US$57.1-billion deal with the International Monetary Fund, criticising the government for turning to international lenders amid an economic crisis. The opposition leader was in full campaign mode on Monday as he gave a talk about what the future holds for Argentina, at an event hosted by the Argentina Project at the Woodrow Wilson Center in Washington DC yesterday. With President Mauricio Macri struggling to contain the country’s current economic crisis, casting a shadow over his plans to win re-election next year no longer, Massa travelled to the United States to present his vision of Argentina's future and to talk up his aim of providing a Peronist alternative. During his time in Washington he also held several meetings with potential investors in Argentina and delivered a lecture at Georgetown University. In his speech at the Wilson Center, the Peronist leader made a case for his leadership of a new coalition, which he said would seek not to be as complacent with Washington as Macri’s pro-free-market leaning government. The Renewal Front leader said he would also seek to be more pragmatic and flexible than previous Kirchnerite administrations. “What we represent, with various governors and mayors, is the idea of a republican, modern, and democratic Peronism, [one] that believes in dialogue, that believes in consensus … that believes the state should be an instrument that helps Argentina’s society,” Massa said. The former presidential candidate went on to list seven critical priorities that the next government should address: educational reform, a "progressive and just" tax system, a federalist system, security, environmental policy, labour, and gender equality. Massa's comments were reminiscent of the Renewal Front leader’s classic third-way stump speech, a position the politician has maintained ever since he broke away from former president Cristina Fernández de Kirchner’s Victory Front (FpV) party – except this time around he was emphasising his differences with the current administration. Despite having previously offered his support for many of the Macri administration's policies, Massa said the government had in the past three years closed itself off through arrogance, saying it had been unwilling to enter into dialogue, a position he argued had in part led to the current crisis. Much of Massa’s main criticisms of the Cambiemos (Let’s Change) administration's time in office centred on its US$57.1-billion loan agreement with the IMF. “When they ask me about the debate over the Fund, when deciding between the Fund and Argentines, I choose Argentines,” Massa explained, arguing that the accord effectively handed over control of the country’s sovereignty over monetary policy to the IMF. The opposition leader also complained that a memorandum about the agreement with the IMF had not been sent to Congress, criticising the government for 'indebting' itself with the multilateral institution, instead of asking Argentines with money abroad to return their cash and support the country. “We are importers of debt, and exporters of savings,” he said, referencing a common theme repeated throughout his address. Massa reminded the audience that Argentina is facing a moment of severe economic difficulty, with inflation expected to top 40 percent this year, high interest rates and a currency that depreciated by "120 percent in the last 24 months." The Peronist leader accused the government of breaking every campaign promise it had made, sayng its policies had contributed to the economic crisis and a feeling of disillusionment in the Argentine people. In another section of his speech, Massa criticised the type of investment Argentina has been attracting, saying the government was focused on becoming exporters of primary products, instead of fostering industries that add value. “Are we going to be exporters of lthium or cellular batteries?" Massa asked rhetorically, referring to the investment boom in lithium production in the northwest of Argentina. In the second half of the talk, Massa faced a Q&A session led by La Naciòn’s US correspondent Rafael Mathus Ruiz who pressed the seasoned politician hard. Asked for his opinion of Brazil’s outspoken far-right candidate Jair Bolsonaro, who is the frontrunner to win the country’s presidential run-off vote at the end of this month, Massa skirted the issue, refraining from offering a personal opinion. Addressing US President Donald Trump’s administration's growing concerned about China’s expansion of its geopolitical influence in Latin America and Argentina, Massa stressed that nations only cared about the bottom line: trade. The Renewal Front leader said he had no preference over whether Beijing or Washington is a better partner, for him it depended upon which foreign country ultimately creates more jobs through commerce for Argentina. “The best ally for Argentina will be the one that provides the most work through trade,” he stressed. Massa instead offered his full support for the Mercosur trade bloc, arguing that Argentina should concentrate on developing its economic and trade relations with members of the region first. “We share economic integration, and have complementary economies and can advance faster in commercial relations," Massa said. Quizzed if he thought President Macri had offered up too many trade concessions to Trump’s administration, Massa avoided answering the question directly and instead said he was speaking in general terms. “It matters more what Argentina’s policy is concerning other nations. We can’t have four different ministries directing export policy,” the Peronist leader said, openly criticising the lack of coordination among the Macri administration's economic team. Asked about his relationship with Cristina Fernández de Kirchner, Massa – who served almost a year as Cabinet chief under the former president – said he hadn't spoken to her in years, asserting that his new own political grouping was not a new version of populism. He argued that while an active and present state might be perceived as populist from the perspective of developed countries, viewed from the standpoint of developing countries, a state with a more active role in resolving a country’s problems should not be labelled with that term. “We choose the most difficult path. To build a solid idea, we need to go back to common sense, from this insanity on both sides,” Massa said.